PlayerUnknown's Battlegrounds (stylized as PLAYERUNKNOWN'S BATTLEGROUNDS) is a multiplayer survival-shooter developed by PUBG Corporation (originally by Bluehole) and published digitally by PUBG Corporation for the PC (via Steam) on December 21, 2017. It was later released for the Xbox One on September 4, 2018 (released by Microsoft as a timed console exclusive) and will be released for the PlayStation 4 on December 7, 2018. It was also ported to Android and iOS devices on March 19, 2018 (and released by Tencent, who released it in China earlier on February 9, 2018). 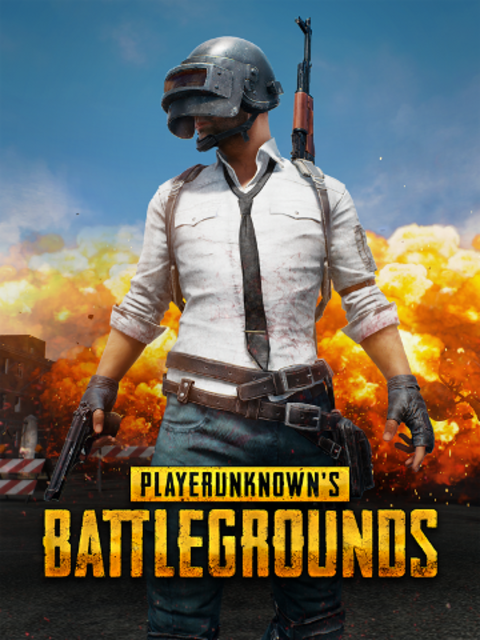 Set in one of multiple uninhabited locations (including the fictional Russian island of Erangel and the fictional Central American desert of Miramar), each match in the game begins with up to 100 players parachuting down at different points from a large aircraft. Whether or not the game is played in teams, players must scavenge weapons, armor, and other items and fight to the death with no respawning and a contracting "safe zone" (an electrical field which slowly kills players outside of its radius). The game is played in two modes: "TPP" (where everyone is in a third-person perspective until aiming down the sight) and "FPP" (where everyone is locked into a first-person perspective). It was developed under direction of Brendan Greene (who goes by the alias PLAYERUNKNOWN), a modder who previously created the original "Battle Royale" mods (inspired by the film of the same name) for ArmA II (as an offshoot of the DayZ mod) and ArmA III and who previously collaborated with Daybreak on H1Z1. The game was originally part of Steam's Early Access program since March 23, 2017, runs on Unreal Engine 4, and is still receiving post-launch content (including new maps, game modes, and modding support). The Xbox One version was originally a Xbox Game Preview title since December 12, 2017. In PlayerUnknown's Battlegrounds, each match begins with up to 100 players, who are flown over the map in a straight line. Each player may choose when to eject, parachuting down to the ground. Players then fight to the death with no respawns. The last player or team left alive wins. The game can be played in either first-person or third-person perspectives, each with their own advantages and disadvantages. Players start with no weapons or items. Weapons, ammo, clothing and other supplies are randomly scattered across the island for players to scavenge for and use to aid their survival against other players. Killed players may also be looted. Weapons are common, with at least one in nearly every building. There are also pilotable vehicles including; cars, trucks, motorcycles, dune buggies and boats. At regular intervals during the match, the safe zone will contract, forcing remaining players to cluster together in a tighter and tighter space. Players who linger outside the safe zone are slowly damaged (and eventually killed) by an electric field. The damage increases as the match goes on. There are currently three modes of play in Battlegrounds (with more to be added as development continues): Solo, Duos, and Squads. Solo is a 100 player free-for-all with no pre-made groups, whereas Duos allow fifty pairs of players to compete, and Squads allows for an assortment of groups sized anywhere from 1-4 players. Players can carry up to two Primary Weapons at a time. S686 (12 Gauge) - Double-barrelled shotgun. Can hold up to 2 shells. S1897 (12 Gauge) - Single-fed pump-action shotgun. Can hold up to 5 shells. S12K (12 Gauge) - Magazine-fed semi-automatic shotgun. 5 shells per magazine. Micro UZI (9mm, common) - 25 bullets per magazine. UMP9 (9mm, common) - 30 bullets per magazine. Optional burst-fire mode. Vector (ACP .45, uncommon) - 13 bullets per magazine. Tommy Gun (ACP .45, uncommon) - 30 bullets per magazine. Optional burst-fire mode. M16A4 (5.56mm, uncommon) - 30 bullets per magazine. Full-auto is replaced with three-round burst fire. M416 (5.56mm, uncommon) - 30 bullets per magazine. SCAR-L (5.56mm, uncommon) - 30 bullets per magazine. AKM (7.62mm, uncommon) - 30 bullets per magazine. AUG A3 (5.56mm, only found in Air Drops) - 30 bullets per magazine. Groza (7.62mm, only found in Air Drops) - 30 bullets per magazine. DP-28 (7.62mm, uncommon) - 47 bullets per magazine. Full-auto only. M249 (5.56mm, only found in Air Drops) - 100 bullets per magazine. Full-auto only. VSS Vintorez (9mm, uncommon) - 10 bullets per magazine. Always equipped with a 4x scope and suppressor. Mini 14 (5.56mm, uncommon) - 20 bullets per magazine. Semi-auto only. SKS (7.62mm, uncommon) - Semi-auto only. Mk14 EBR (7.62mm, only found in Air Drops) - 10 bullets per magazine. Kar98k (7.62mm, uncommon) - Uses two methods of reloading: clip-fed (when the weapon is empty) and single-fed (otherwise). Can hold up to 5 bullets. M24 (7.62mm, only found in Air Drops) - Magazine-fed. 5 bullets per magazine. AWM (.300, only found in Air Drops) - Magazine-fed. 5 bullets per magazine. Crossbow (bolts, common) - Single-shot hunting crossbow that fires high-damage bolts silently. Win94 (ACP .45, uncommon, only found in Miramar) - Single-fed lever-action rifle. Can hold up to 8 bullets. Players can carry only one Secondary Weapon at a time. P92 (9mm, common) - 15 bullets per magazine. Semi-auto only. P1911 (ACP .45, common) - 7 bullets per magazine. Semi-auto only. R1895 (7.62mm, common) - Single-fed. Can hold up to 7 bullets. Semi-auto only. P18C (9mm, uncommon) - 17 bullets per magazine. R45 (ACP .45, uncommon, only found in Miramar) - Chamber-fed. Can hold up to 6 bullets. Semi-auto only. Sawed-off (12 Gauge, uncommon, only found in Miramar) - Double-barelled shotgun. Can hold up to 2 shells. Flare Gun (flares, only used in custom games) - Single-shot flare gun that deals no damage. Instead, successfully firing it up in the air causes a custom Air Drop. Along with standard low-damaging fists (which can be active at any time when the player holsters their weapon), players can equip a single Melee Weapon. Pan - Deflects bullets (both equipped and unequipped). Players can only equip one type of Grenade at one time. In earlier version of the game, players can pick up and throw apples in the pre-game lobby for practice. Honey, I Shanked the Murder Island! 130 - Helmut Kruger Jr.